Mix adventure and culture in this exploration of Buddha's Island as we cycle through village backroads, trek through verdant highlands and white water raft down the Kelani river. At the same time explore some of the iconic cultural sites including ancient capitals (Polonnaruwa & Anhuradhapura) and Bhuddist shrines and temples. Finish the trip by relaxing on one of the country's tropical white sandy beaches. Leaving after breakfast we drive to Giriulla, from where we begin our morning's cycle ride along lush forested back roads to Padeniya. After stopping for lunch we have time to freshen up before swapping the bikes for jeeps and heading in to Wilpattu National Park. Despite the park's location in Sri Lanka's dry zone, it boasts nearly 60 lakes and is renowned for leopard, elephant and sambar deer spottings. We will go on a jeep safari in the hope of spotting the elusive leopard. We choose to visit this park, rather than Yala National Park further south because we believe it offers our customers a better experience. The same animals can be seen here as in Yala and despite being busy in places it is overall less crowded, making our visit more enjoyable and responsible. It is also worth noting that wildlife is unpredictable and therefore sightings cannot be guaranteed. We camp on the outskirts of the park this evening. Total cycling distance 45kms. Today we take to our bikes again and cycle towards Anaradhapura. We will then drive out to the UNESCO World Heritage Site at Dambulla, where a great series of caves hide an incredible collection of temples that date back to the 1st century BC. Containing a large number of Buddha images, as well as sculptures of Hindu Gods, the caves have become a huge pilgrimage site for countless worshippers, and this afternoon we will visit five separate caves, before proceeding to Sigiriya for the evening. Total cycling distance 50km. An early rise this morning takes us to the imposing Lion Rock for the climb to the Sky Fortress before the heat and peak period of the day. The ruins of this 5th century fortress (declared a World Heritage Site in 1982) are one of Sri Lanka's major attractions, a stupendous sight to behold and a feat of consummate engineering skill. A switchback series of steps ascends to the top and half-way up, tucked beneath a sheltering overhang of rock, are the famous Sigiriya Damsels. These frescoes, their ancient colours still glowing, once covered an area of some 140 metres in length and are the only ancient non-religious paintings to have survived into modern times. On arriving at the summit (200m) we are presented with some magnificent views of the surrounding country, as well as the remains of what is left of the palace of King Kassapa. Returning to the base of the fortress, we then cycle to the ancient city of Polonnaruwa, following a series of relatively straight and flat back roads that provide us with a moderately easy journey that passes through patches of forest, plantations and rural villages. For those that wish it, there is the option to break up part of the 30 km journey to Polunnaruwa by travelling along sections of it by bus. Polonnaruwa reached the height of its glory in the 12th century and the city is still blessed with a number of its ancient buildings and monuments. This morning we visit the ancient city, taking in the spectacular ruins of its Royal Palace, with its Audience Hall, Bathing Pool and Quadrangle. Close by is the Circular Relic House, a curious round structure with a beautifully preserved 'moonstone' carved at the foot of a flight of steps. Another famous feature of the deserted city is the group of carved images of Buddha known as Galvihara, a collection of four colossal figures, all hewn out of solid granite. In the afternoon we visit the nearby Minneriya National Park by jeep, home to spotted deer and significant herds of elephant, as well as huge populations of migratory birds. 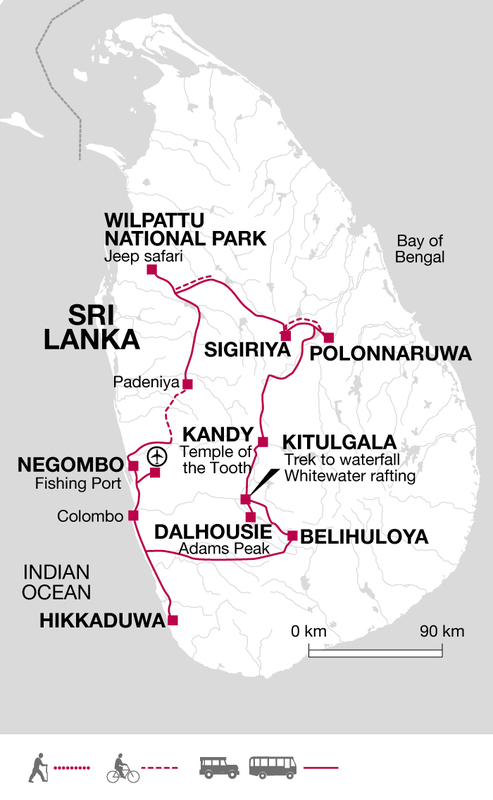 This morning we drive to Giritale, travelling via Elahera and Pellegama, to a point where the crossover point between east and west Sri Lanka lies. Known as Riverstone Point, this region is home to the Knuckles Mountain Range and offers us a chance to break the journey with a short hike along a trail that runs through the ranges. Resembling a clenched fist (hence their unusual moniker), the mountains present a remarkable microcosm of the country, the striking landscapes and isolated cloud forests providing a haven for a rich diversity of flora and fauna. Our walk will take us around 3 hours, a soft to moderate trek that takes us through a landscape of incredible historic and natural importance. To the south and east lies the Mahaveli Valley, whilst the Matale Valley to the west encircles a collection of peaks that has no equal anywhere else in the country. Returning to our bus, we then complete the journey to Kandy, descending into the Matale Valley also known as the spice valley of Sri Lanka, to arrive at our hotel late this afternoon. A packed lunch will be provided today, to enjoy en route. Lying in the mountains, to the northeast of Colombo, Kandy was captured by the British in 1815 and is known more for its cultural and spiritual importance rather than its history. Buddhists from all over the world come to this delightful old highland town specifically to visit the Temple of the Tooth, the Dalada Maligawa, where the costly jewelled shrine of the holy tooth (said to be Buddha's left canine and measuring in at an impressive 3.5 cm long by 1 cm thick) is kept. This relic was believed to have been brought from India some 1,500 years ago and is the major attraction of the town. With a free day in the city, there will be an opportunity to visit the temple today. Kandy itself is also a living monument to its traditional past being the last capital of the Sinhala Kings. It in fact retains much of its old world charm and its streets are a wonderful eclectic mix of noise and bustle, making it an ideal venue for some personal exploration. You could also take a wander through the lush Royal Botanical Gardens at Peradeniya, located just outside the city, or perhaps explore something of the city's handicraft workshops, which have plenty of brassware, batik, lacquer work and other craft items to choose from. Kandyan dancers can also be seen performing every night at one or two locales around town, so those interested in some cultural interaction tonight might like to venture out and enjoy some traditional Sri Lankan dancing. This morning we drive to Dalhousie where we have the afternoon to relax not far from the mighty Adam's Peak. Shortly after midnight we join pilgrims in an ascent of the spiritual mountain, known locally as Sri Pada. A depression at the top of the peak is said to be Buddha's footprint and each year thousands climb to the top for sunrise. There is a stone staircase which we follow right to the top, it can be tough on the legs but we can take our time and savour the experience. We reach the top in time for sunrise and views across the country. The climb to Adam's Peak can get really busy due to the volume of pilgrims that take part and sometimes we do not get to experience the sunrise from the top, however its an experience worth sharing with the locals. On descent from the climb up Adam's Peak we return to our guesthouse to freshen up and enjoy breakfast. Later in the morning we drive to Ginigathhena, set amongst the fertile and lush western highlands. Set amidst a dramatic landscape of towering cliffs and wild water, the Kelani Ganga provides some of the best whitewater rafting in the country. The jungle around here was used as the back-drop for the 1957 film Bridge on the River Kwai and the grade 2-3 rapids provide us with the perfect combination of scenery and excitement. As we raft down to our accommodation in Kitulgala we cover a 7km section of the river through 8 rapids which will usually take approximately 1.5hr hours to cover (dependant on water levels). Taking lunch en route, we should arrive at our overnight lodge late this afternoon and after a chance to relax and if time permits this evening there will be a chance to join an optional trek across the river and through the jungle to a hidden waterfall. After breakfast we take a short trek through the forest to a nearby village. The route takes about three hours in total. 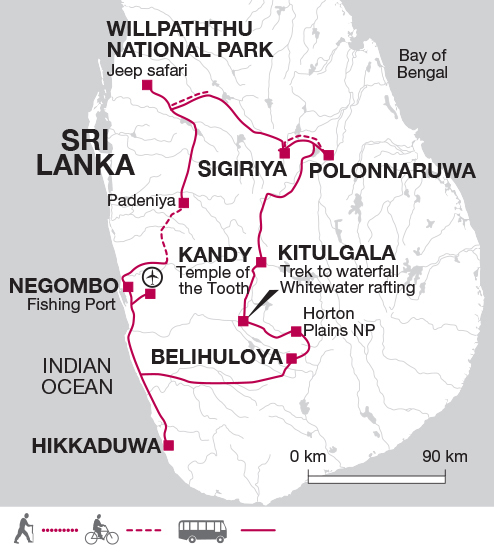 We then drive to Belihuloya, via the small towns of Bogowantalawa and Balangoda, where we camp for the night. We start this morning with a short bus transfer to Kinchigune where we take to our bikes. We follow quiet back roads and pass through small villages. The route covers around 15-20km and takes us about three hours, depending on how many times we stop to chat to the villagers along the way. We meet up with our bus and then drive to the coastal resort of Hikkaduwa. Along the way we have the chance to stop at a Responsible Tourism Partnership project known as The Dickwella Lace Centre, a locally run project that provides income and training for villagers who were badly affected by the 2004 tsunami. The next two days are free to enjoy the laid back ambience and turquoise waters of Sri Lanka's southern coast. Rich in colonial history and golden beaches, the region offers us a wealth of options to enjoy the most of our time here.There are snorkelling trips available, Ayurvedic massages and the possibility to enjoy a whalewatching trip during the migrating season (December to April). You could also pay a visit to the city of Galle and its historic colonial fort, a UNESCO World Heritage Site that remains one of the best preserved examples of colonial fortification in the world. Day free to continue exploring this area. After an early breakfast we transfer to Colombo Airport where the tour ends. Select your clothes carefully, bearing in mind that the climate is tropical and that upland areas are cooler and more temperate. Lightweight rainwear is also essential, and warmer clothing for the highland walks and chilly night temperatures in the mountains. You may also find cycling gloves, shorts or trousers useful. When visiting religious sites you will need to dress respectfully by covering you knees and shoulder plus taking off your shoes and hats. You will need to bring long trousers, or buy a sarong locally. Don't forget your swimming costume. Comfortable trekking boots, shoes and sandals. Binoculars, head torch, insect repellent, sunglasses, sun cream, cycling helmet and a cycling water bottle. You may also wish to bring with you a gel saddle. Whilst in tea country there are leeches and you may wish to take leech socks. Accordingly, you should allow £40 for tipping. Your tour leader will account to you for any organised tipping. Sri Lanka: All foreign nationals who intend to visit Sri Lanka for a short stay of up to six months, including transit passengers, must apply for travel authorization online prior to travel to the country. To obtain an Electronic Travel Authorisation (ETA) you must visit http://www.eta.gov.lk to apply for it prior to travel. It is strongly recommended that you print and bring a copy of the ETA approval notice with you. The Sri Lankan authorities require that your passport must be valid for at least 6 months after departure from Sri Lanka. This tour is ideal if you are looking to combine Sri Lanka's cultural highlights with some active adventure. The rafting, cycling and walking are all fairly gentle and suitable for all levels of fitness and are a great way to get off the tourist trail.